The Blades got the first good chance of the game when Warrior netminder Brandon Stone turned over the puck to a Davis Vandane Blade on the half wall, only to see Vandane rip a shot wide of the open net. 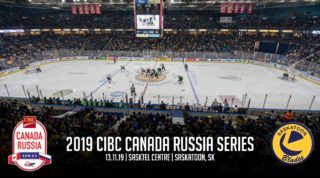 The Warriors were able to get two pucks past Blades starting netminder Steven Stanford, but not past Stanford’s goalposts as Moose Jaw rang a couple off the iron but were unable to light the lamp first. Following a Warrior turnover in the neutral zone, Sena Acolatse carried the puck into the Moose Jaw zone and wristed a shot past Stone to make it 1-0 Blades. Just a couple minutes after though Dylan Hood roofed a puck over an outstretched Stanford to tie the game at one. There was no more scoring in the first period and both teams headed to their respective locker rooms in a draw. Shots after one period favoured the Blades 13-9. Adam Todd replaced Stanford in net for the Blades to start the 2nd period and was beat on the first shot he faced when Michal Hlinka opted to keep on a 2 on 1 and beat Todd short side to give the Warriors a 2-1 lead. 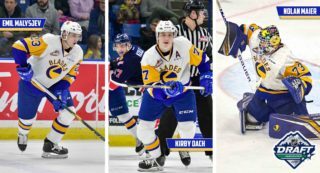 With just seconds remaining in Blades PP, Sena Acolatse had a Darren Dietz point shot land right on his tape and Acolatse made no mistake putting home his 2nd goal of the contest, tying the game at 2. Shots after two periods were the Blades 24, the Warriors 16. The Warriors carried most of the play in the final minutes outshooting the Blades 12 to 5 as well as scoring the only two goals of the period, both off the stick of 19 year old veteran Riley Reinbolt. Reinbolt first pounced on a big rebound off the pads of Blade netminder Adam Todd to give the Warriors the lead. Reinbolt then was the recipient of an errant Blades pass; he made no mistake snapping a puck past the glove of Todd to round out the scoring. Final shots on goal favoured the Blades 29-28. 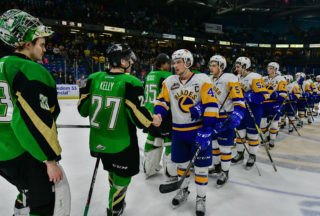 The Blades next action will take place Wednesday when they travel to Regina to play the Pats. 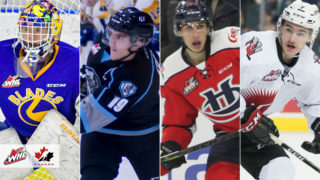 The Blades next home game is Saturday Sept 18th when the Blades host the same Regina Pats in their final pres-season game. 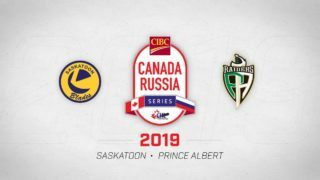 The Blades then open the 2010-11 regular season on Friday Sept 24th when they host the Prince Albert Raiders. Tickets for the home opener, and all Saskatoon Blades home games, are available from any Ticketmaster location.